Are you an Ex-pat and want to get Dish Network USA in Panama? General Information: Due to the weak electromagnetic satellite footprint from the North American satellites in Panamá, the first thing that you will have to do is to purchase a huge 300 cms (10 feet) offset antenna/dish to get an acceptable satellite reception. Therefore, the small 3 ft. dish from the United States won’t work if you would like to enjoy all your TV in High Definition. After that, everything is the same as in the U.S. where you install your dish on your roof top or you attach it to a ground pole, you will then run RG6 coax cable from the HDTV LNB to the house into the receiver. Also, you will have to purchase from us or rent an activated and legit satellite receiver provided by Dish Network Latino. 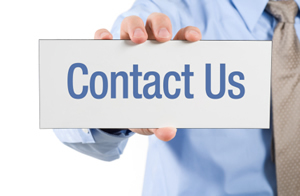 In regards to the activated satellite receiver, it is important to mention that you will need a valid US Address because Dish Network USA will provide the service to you thinking that you still live in the U.S. and not in Panamá. 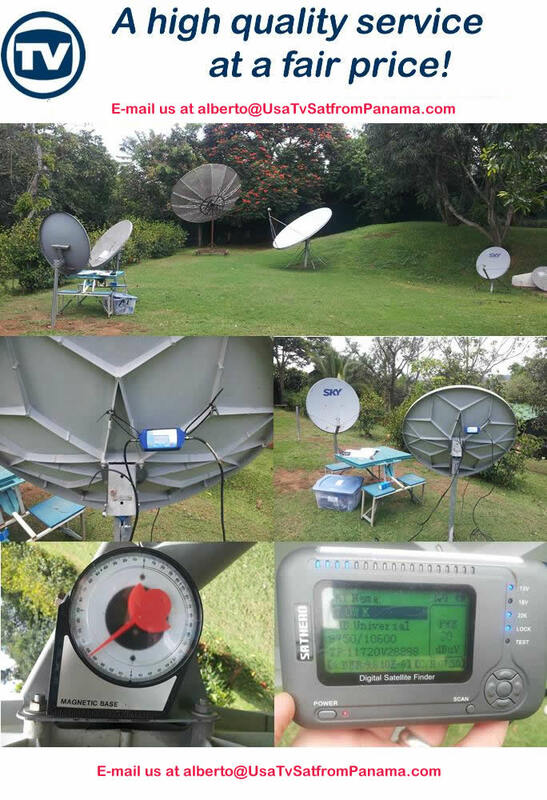 Once the 300 cm (10 feet) Big dish is properly installed and pointing to the satellite, and the activated satellite receiver is hooked up to the receiver, you will only need to pay the monthly fee for your Dish Network USA suscription to start receiving U.S. All-in-English speaking satellite TV programing in your household in Panamá. 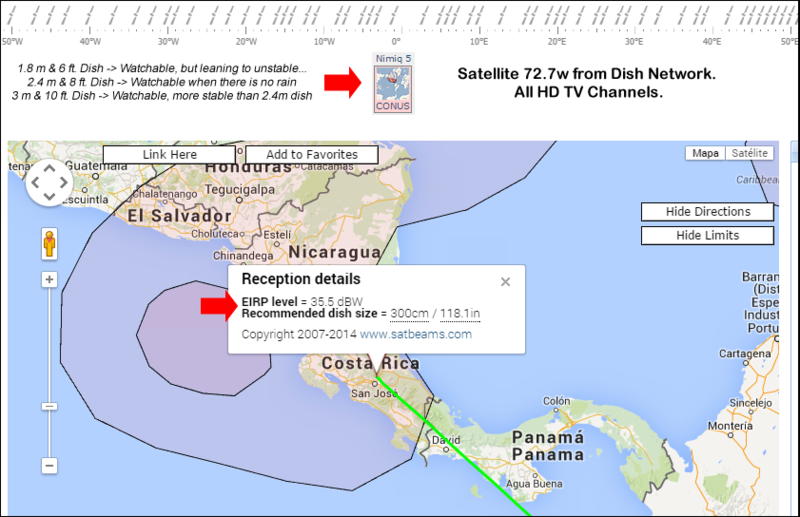 In Panamá, you can only get HD TV from 2 old WEST ARC Dish Network Satellites : 110w and 119w. The satellite orbiting at 119° west will give you 8 HD TV Channels and the other bird at 110° west will provide 17 HD TV Channels. Using a big 10 ft. dish will allow you to use all DVR features. 77° West TV Channels + 110° West TV Channels. 77° West TV Channels + 119° West TV Channels. In general, a professional DISH NETWORK Satellite TV installation with a 10 ft. Big Dish is around USD $2,499 anywhere in the Great Metropolitan Area in Ciudad Panamá. Keep in mind that there is a more affordable “Small 3 ft. 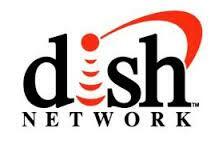 Dish – All in English Satellite TV solution” for USD $1,100 in this link. It is a fact that when it rains, the electromagnetic waves get degraded on the 10 ft. dish antenna and thus, the satellite TV signal could go away for sometime. 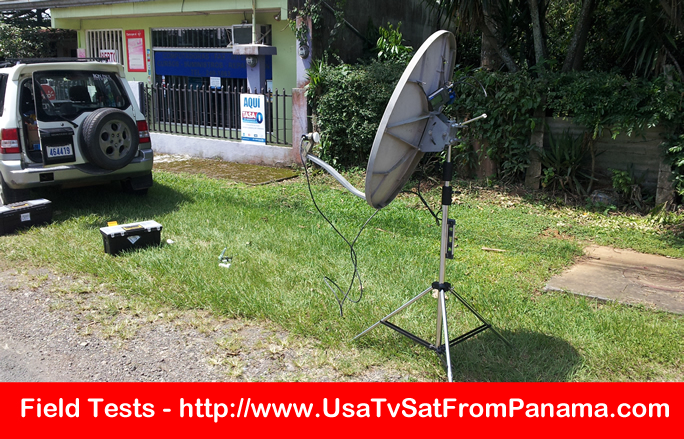 It is important to know that even though you purchased a huge dish antenna that the already weak TV signals from the North American satellites (Dish Network USA) are not meant to be tuned in from Panama. Said in other words, when it rains, your 10 ft. dish won’t help you but the 3 ft. dish will keep the HD Networks and SD TV Channels alive. If you want a more stable “anti-rain” solution with Dish Network USA (say you …work in a SportsBook or you are the owner of a Sportsbars, the bar is full of clients watching the Superbowl.. and you want the HD TV Channels to remain available during the rainy season.) then you will need to look at a 13 ft. or 3.8 mt dish antenna. This super huge dish antenna costs around USD 7,000 . Also, it is important to mention that some clients have reported to have better performace with “Dish Network USA with small dish on satellite 121° West” and DirecTV Puerto Rico with small dish on satellite 95° West under heavy rain. Even though, both satellite tv packages from U.S. and Puerto Rico require smaller 3 ft. dish antennas, the electromagnetic footprint from both U.S and PR satellites is so strong that they can outperform a 8 ft. or 10 ft. dish antenna pointing to the american satellites from Dish Network USA. Said in other words, some people with a 3ft. antenna are watching ESPN under rain in Panamá while some other people with just a 10 ft. antenna are just turning their TV off.